So far, it seems like you need very specific ooze to reincarnate. Either consumed (in the case of Saki and his previous incarnations) or injection (in the case of the Hamato family). So long as it gets inside you. And even the little bit that Hob got when he tried to make off with Raphael was enough to mutate him. And I’m sure Hob’s bias against human-born Mutants will come back to bite him one day. Like maybe Dreadmon starts a group of formerly-human-Mutants to oppose Hob? That would be a great turn for Dreadmon, and keep up with a "cat vs dog" element to things. Maybe Stryacodons could be introduced as reincarnated Neutrinos? EDIT: Someone else suggested Mondo and Herman’s personalities were due to their owners. Last edited by miru; 09-28-2018 at 07:56 PM. That's kind of good though. It makes things more variable and complex, and presents the "science" as something you have to actually put some time/thought/effort into and not just something that happens in 5 minutes. Bebop & Rocksteady are so rediculously invulnerable that I wonder if the rhino/warthog thing is just superficial and the real power comes from something else. After all, when they were mutated, they were given a list of animals they could choose from to become. If they had chosen a squirrel they would have probably been just as powerful as they became . With this list, I guess if one is just using the ooze maybe they aren't mutants, but using the mutagen makes you a mutant. I think the mutants who were humans have the edge cuz it seems the animal appearance is just that, an appearance (maybe not fully, like with Rocksteady and his horn) and their strength come from something else, whereas the mutants who weren't human seem to have the strength based on the kind of animal they are. With some training they become powerful in their own right. Seymour is a bit of an oddity, but I wouldn't exclude him from this list. I'd still love to learn how Baxter creates the organic components for those! Hey, don't you read Marvel Comics? If anything, squirrel mutants are even more ridiculously overpowered! I didn't. I put him in the third list of characters who don't fit the human/non-human lists. As far as Ocho goes, I'm kinda skeptical cuz of Kitsune's connection to Krang around those time periods. So you never know. I was originally going to say that I think he could be some sort of genetic chimera, and maybe he is. His skull is more animal than human, and his organs, well... Most animals' organs resemble each others', so who knows. He looks more animal than human to me at any rate. The mutagen basically does whatever the writers want it to do. This has been the case in any TMNT universe/series ever. Yeah, Ocho is specifically a Yokai. 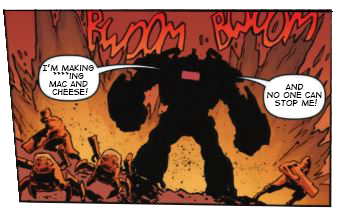 Also, they never really specify what the Utroms were doing with ooze in IDW. Besides as a "necessity for life and technology", but that's pretty vague. They're never depicted to actually USE it. Their walkers seem to be running on some other kind of power, and the ooze for stasis had to have some radical messing about with in order to work like it did. The thought just occurred to me, Ocho is pretty much the TMNT equivalent of Juggernaut: a powerhouse and something other than a mutant, mystical in nature, but everyone mistakes her for one in and out of universe, and it's conceivable that she could one day be adapted as such to make things simpler. Also, they never really specify what the Utroms were doing with ooze in IDW. Besides as a "necessity for life and technology", but that's pretty vague. I forgot about Wyrm. I guess the non-human animal list, but the hive mind thing makes it different from the usual. I wonder if we'll see Wyrm again in this series.